A special holiday shopping safety message from Lancaster Station’s Captain, Todd Weber. A special shopping safety message from Lancaster Sheriff's Station Captain Todd Weber. "With the holiday season upon us, many of us will be celebrating Thanksgiving with our loved ones. Many shoppers will be out looking for big bargains on Black Friday or online for Cyber Monday, but so will criminals. Here are 10 tips to help you stay safe while you shop. 1. Do not buy more than you can carry. Plan ahead by taking a friend with you or ask a store employee to help you carry your packages to the car. 2. Shop online with companies you know and trust. Check a company’s background if you are not familiar with it. Remember, if it sounds too good to be true, it usually is. 3. Save all receipts. Print and save all confirmations from your online purchases. Start a file folder to keep all receipts together and to help you verify credit card or bank statements as they come in. 4. Consider alternate options to pay for your merchandise, such as onetime or multiuse disposable credit cards or money orders, at online stores and auction sites. 5. Wait until asked before taking out your credit card or checkbook. An enterprising thief would love to shoulder surf to get your account information. 6. Deter pickpockets. Carry your purse close to your body or your wallet inside a coat or front trouser pocket. 7. Have your keys in hand when approaching your vehicle. Check the back seat and around the car before getting in. 8. Do not leave packages visible in your car windows. Would be thieves will not only steal your packages, but break your car window to access them. Lock your items in the trunk or, if possible, take them directly home. 9. If you are shopping with children, make a plan in case you get separated. Select a central meeting place and make sure they know they can ask mall personnel or store security employees if they need help. 10. If you see something, say something! (661) 948-8466 or in case of an emergency, dial 9-1-1. This is a joyous time of the year. Let's make sure you and your family are safe. 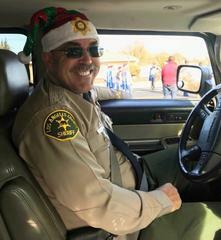 Happy Holidays from myself and our deputies at Lancaster Sheriff's Station!"